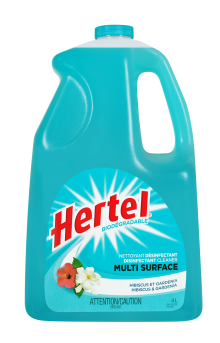 Hertel MultiSurface Disinfectant Cleaner is ideal for cleaning large surfaces such as floors, walls and ceilings, and for making them shine. It also makes your job easier – there is no need to rinse or dry so it is almost effortless! 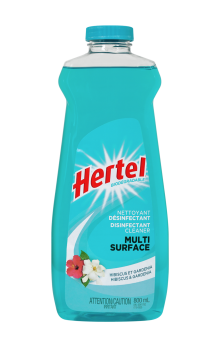 Biodegradable and phosphate-free, Hertel MultiSurface Disinfectant Cleaner leaves a fresh, clean scent throughout your home. With this sunny and floral fragrance, Springs invites itself into your home. Inspired by the exotic combination of hibiscus and gardenia flowers, its delicate scent will simply enchant your senses. TO DISINFECT hard non porous surfaces: Pre-clean surfaces prior to disinfection. Apply the Hertel Multi Surface directly on the surface and let stand for 10 minutes before rinsing and wiping clean. CLEANING: Dilute 125 mL into 8 litres of water. Apply onto surface using a cloth or a well wrung mop. No need to rinse or dry.